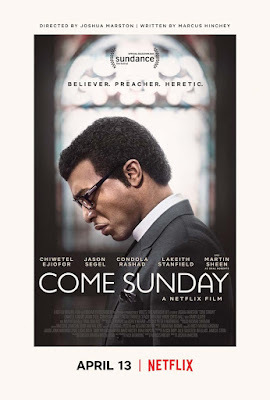 Netflix didn't make a huge splash at Sundance this year, but they earned some of the festival's best reviews with Come Sunday. Most of the praise was heaped upon star Chiwetel Ejiofor's impassioned lead performance as real-life Bishop Carlton Pearson, whose views on the afterlife cause controversy within his congregation. Directed by Joshua Marston, best known for Maria Full of Grace, the story centers on Pearson who hears a voice from God and comes to believe that man has already been saved and there is no reason to fear Hell. This belief in universal reconciliation got him labeled as a modern day heretic. It's a slightly different exploration of faith than we're used to seeing on the big screen, and again, Ejiofor looks like he is at his best. Also starring Martin Sheen, Jason Segel, Lakeith Stanfield, Condola Rashad, and Danny Glover, Come Sunday hits Netflix on April 13th.